Sold by NatureBond Australia and Fulfilled by Amazon. Gift-wrap available. 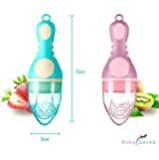 ★ MOST VALUE FOR MONEY BABY FRUIT / FOOD FEEDERS & TEETHERS (2 PCS w 6 Silicone Teats) – NatureBond Baby Fruit Feeders and Teethers are designed in candy-like colors that stimulate baby’s appetite for consumption of natural nutrients from fruits and vegetables. It is also a safe way to introduce our little ones to solid food while they go through weaning and teething phase. The All-IN-1 feeder can also soothe baby's teething discomfort by massaging the gums through chewing. ★ QUALITY & SAFETY ASSURANCE – It is the only Baby fruit feeder that is USA FDA approved and certified by Word’s Leader in Testing, Inspection and Certification (TIC),Bureau Veritas USA, to be BPA Free, Latex Free, Lead Free and Phthalates Free. ★ DESIGNED TO BE EASY TO DISMANTLE AND WASH/CLEAN – Our designers ensure the feeder is easy to dismantle and wash as hygiene and safety are our topmost priority. Unlike other feeders, NatureBond feeder has no irremovable components and can be fully dismantled for washing and cleaning purposes. 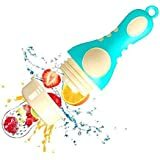 ★ INNOVATIVE FEATURES – Turning knob for custom adjustment of teat length and to squeeze the fruit juices out for consumption. 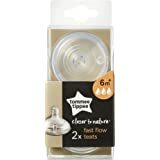 ★ ALL SIZES INCLUDED – 2 x Feeders and Bonus pack of 6 silicone sacs / teats for different ages of baby/toddlers. (2 Large Sizes Sacs are pre-packed with Feeders. Additional 2 Small Sizes and 2 Medium Size included for parents to have more options). We value you and your baby's comfort and convenience. Unlike other feeders which do not provide different sizes, we recommend customers to use an appropriate size for your little ones. Sold by NatureBond Australia and ships from Amazon Fulfillment. We wish to create the happiest experience in fruit tasting & teething for your baby. The NatureBond Baby Fruit Feeders are both a fruit feeder and teething toy. The package comes with 2 feeders. The sacs can be used to store fresh or frozen fruits, vegetables and ice chips. 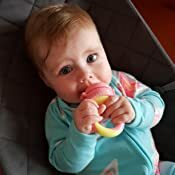 Most importantly, it provides a safe method for our little ones to enjoy the natural vitamins and nutrients from fruits pulps and juices without the dangers of choking. 1. Safe for baby - Tested against USA FDA regulations and certified free of BPA, PVC, Phthalate, Lead and Latex (ASTM D6499 Test). 1st and Only Baby Fruit Feeder lab tested and certified by Bureau Veritas, a World's Leader in Testing, Inspection and Certification. 2. More than 20 years of experience in manufacturing baby products and breast pumps. 3. Easy to use and maintain: Our baby fruit feeder is well-designed to dismante easily for washing purposes and leaving no hidden corners behind. Quality assurance with improved locking mechanism. Innovative turning function to allow the fruits and vegetables to stay at the bottom of the teat to ease teething. 4. Designed in AppetizingColors which aids in simulating appetite of our little ones and it is one of the best ways to introduce fruits in our love ones' diet since young. Designed in USA. 5. 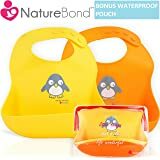 Most Value for Money - full package of 6 Silicone Sacs / Teats(Additional 2 Small & 2 Medium Size & 2 Large Sizes Sacs are attached with Feeder) which allow parents to customize according to your child’s requirements and comfort. Suitable for aged 4 months and above. 6. Product includes instructions sheet with Full Color illustrations on usage of NatureBond Baby Fruit Feeder.